Trumpeter has made quite a name for themselves when it comes to 1/32nd scale aircraft models; they must have as even I as a primarily armoured fighting vehicle modeller has heard as much. One of Trumpeter’s latest offerings is the Messerschmitt Bf 109G-2 Tropical in 1/32nd scale. The Messerschmitt Bf 109 has to be one of World War Twos iconic fighter aircraft having served throughout World War Two in its various forms. During World War Two there were 1,586 Bf 109G-2 versions of the aircraft built which does mean there is plenty of scope for those who would wish to finish their model in a style other than offered in the box. The perfect place to start this review is with the instruction booklet. The booklet consists of just 12 pages which did catch me out as I was expecting it to be larger, the paper is a matte white fairly heavy quality and has good clear print. The instruction booklet breaks down as follows; it begins with the now standard symbol and decal application guide, I will admit to missing the short introduction to the object then model is based on as I feel that it is a good thing to provide a background as I know that introductions lead me in taking an interest in history. You are then provided with a pats map and I would always recommend it is checked against the contents of the box. The instructions guide you through construction in just 15 stages which reduces to 14 stages if you opt not to add the external weapons and fuel tank supplied. The instructions use black and white line drawings to guide you, these look pretty clear to me as they are not overly busy with the exception of the first two stages. As the first two stages of construction cover the majority of the cockpit and engine assemblies, these are really a number of stages printed as a single stages. The quality of the mouldings is very good on the whole with the only weakness I noticed being the flow marks in the plastic in numerous locations which in some cases result in a light groove to be present. Having built a large number of Trumpeter’s armour models there is one area where they have a poor record; this area is the ejector pin marks which can cause a lot of work cleaning up and be in areas that are difficult to work. I am pleased to say that while there are a number of ejector pin marks present they all appear to be in areas that will not be seen for the most part, however as I have not built the model yet it is possible that some could be and I will add that the marks I have looked at look to be very shallow, not overly large and easy to get at. As stated the instructions begin with the construction of the majority of the cockpit. This stage is busy but easy enough to follow if you take your time from what I can see. I have checked the cockpit layout against my reference and the only area that I can see that may be incorrect is the stick, my reference indicates the handle of the stick is bent to the left; this does make sense in that it would place the hand and wrist in a comfortable position for a person who is right handed, This is also easily corrected by applying a small amount of heat at the desired location and then bending the handle top the desired angle. There is a decal for the various instruments which you are instructed to lay over the face of the instrument panel, my gut instinct tells me it would be better to carefully paint the instrument panel and place the decal behind it; however your opinion may vary. The next area tackled is the Daimler Benz DB605A engine; detail throughout is again very good and when painted should make for an eye catching area of the model if exposed. I have not been able to locate any real areas of concern other than some parts placements in the instructions could be better. Accuracy wise everything looks good when visually checked against my reference. The weapons added during construction off the engine are a little hit and miss as some have been slide moulded meaning the tip of the barrel is hollow but this is not the case throughout and it is my intention to look into replacement of some of the barrels with turned metal offerings. The next six stages finishes adding some detail parts to the interior of the fuselage for the cockpit area, the propeller assembly, mating the engine to the cockpit and assembly of the main wheels and struts. I do not see any issues that are obvious however I know that armour modellers are not keen on vinyl rubber tyres as they can breakdown due to the use of weathering products. A very positive aspect to me is the inclusion of photo etched seat harness straps which I know will look better than the moulded on detail I was expecting. The wings are tackled next and also includes I believe the addition of a fuel tank just behind where the cockpit will sit. Panel lines are very good with the rivet detail being so fine that I can see it but not feel it. The control surfaces of the wings are all made of separate parts; the leading edge flaps can be accurately depicted open as they would on the ground. The radiator shutters can be displayed open and they have some nice detail to view, the flaps and the ailerons would appear to be fixed judging by the connection method however careful removal of the connecting part will allow the free positioning of both. You should remember that if you intend to use the external fuel tank and under wing mounted cannons you need to open up the connection points. The next two stages bring the cockpit, engine, fuselage propeller and tail elements together. I can see no real problems with this however I am a little disappointed; you have spent all that time building the Daimler Benz DB605A engine and Trumpeter put the effort into providing that engine , but Trumpeter has not supplied the option of displaying the engine cowlings in their open positions. I know that it will not be beyond most modellers to correct this issue but I cannot help thinking the option should be in the box. The control surfaces for the tail also have the same issue that the wing control surfaces have but can again be tackled in the same way. Trumpeter has included some very nice detail on the inner face of the engine cowlings but there are also a number of ejector pin marks that will need to be tackled. The tail wheel is also completed here and again has a vinyl rubber tyre which may suffer the issues mentioned previously. The cockpit canopy is tackled next and Trumpeter has done a very nice job in this area. The mouldings are very clear with no obvious flaws to the finish which would easily mar it. The armoured panel behind the pilots head is nicely done in photo etch and has a separate headrest in plastic and which I believe was made of leather. I cannot see any reason why the canopy could not be shown in an open position, however Trumpeter has again not gone into that possibility in the kit. The next two stages adds the wing assembly to the model, the engine cowling with the oil cooler, and the main wheels. 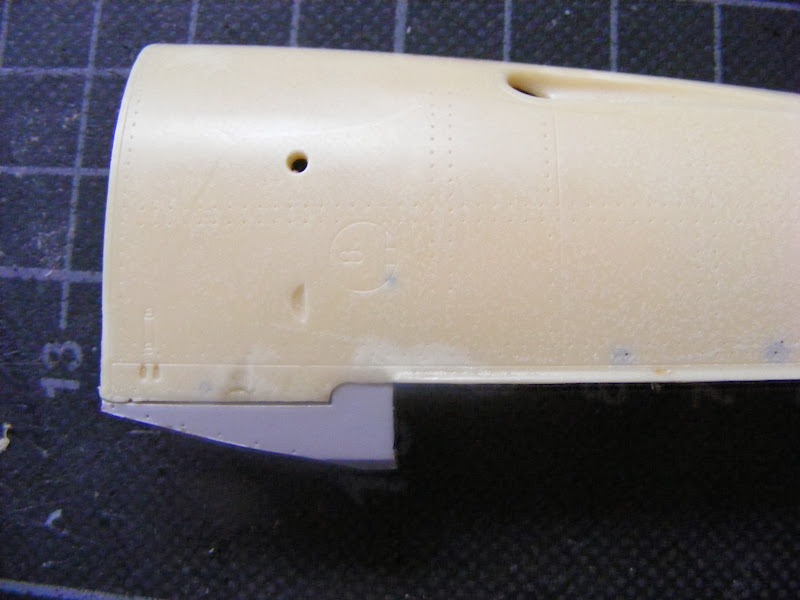 You also have the option of assembling the external fuel tank if you are going to use it on the model. I see no concerns here as regards assembly with the possible exception of getting the wheel struts in the correct orientation depending on how well they fit. Trumpeter has again failed to provide the option of having the lower engine cowling in an open position. The model could be called finish by this stage unless you intend to add the external fuel tank and/or the under wing mounted cannons, the additions of these parts should be a breeze as long as you remembered to open up the locating points. The decals for the model look to have good colour but I admit it is not an area I am an expert in. the reference I have used does show a large number of information placards around and in the aircraft which may not be all supplied with the kit. While on the subject of decals it should be pointed out that there are two finishing options offered, however I have been unable to locate exactly what and where the finishing options represent. It is my belief that this will build up into a very nice model of the Messerschmitt Bf 109G-2 Tropical version, however I cannot help feeling that Trumpeter did only half a job with the possible display options. The ability to show the engine cowlings and cockpit canopy open should I believe have at least been covered in the instructions for modellers who will not always know the ins and outs of their models, and I believe this would be a selling point for the model which may have generated sales for Trumpeter. however all of that said these complaints can be easily overcome by most modellers with a little skill. Highs: The inclusion of photo etched harness detail and a well detailed engine and cockpit rank highly with me. Lows: The extra work not covered by Trumpeter to allow the display to the fullest of the engine and cockpit. The reviewer forgot to mention that the engine is one centimeter too short in length and negligibly narrower, the fact that the cowlings to be historically accurate require pieces to be cut off the fuselage and glued to them(the pieces right behind the exhaust stacks), the cockpit floor sits about three millimeters too high details a bit undernourished, landing gear details are spartan at best, all these problems being inherited from the 1:24th scale kit that is this release's originator. Good thing that it is accurate in general outline. The engine problem could be sorted out only by replacing it with a resin one. All the other issues are trivial to fix, fit of parts is excellent. You don't care about accuracy that much, fine, it will build like a dream. If you do, it has issues that shouldn't put you off. Florin thank you for pointing that out as it is not so much a case of I did not mention it, it is a case of I did not know and judged the model against pictorial reference which looked right to me. I do still believe it will make for a good looking model and while not 100% accurate what kit is. Like I said, the issues are trivial if built closed up, very little to no filler required, an easy build. And if you want to go crazy, it is a good base to start with. I'll try to illustrate the fuselage cuts for those that might find it useful. Thanks for the review, Darren. I am fine with the kit if it goes together well. I look forward to seeing the build. Florin, I do enjoy seeing what can be done with a kit for those who have the skill and intent, and look forward to your post as well. 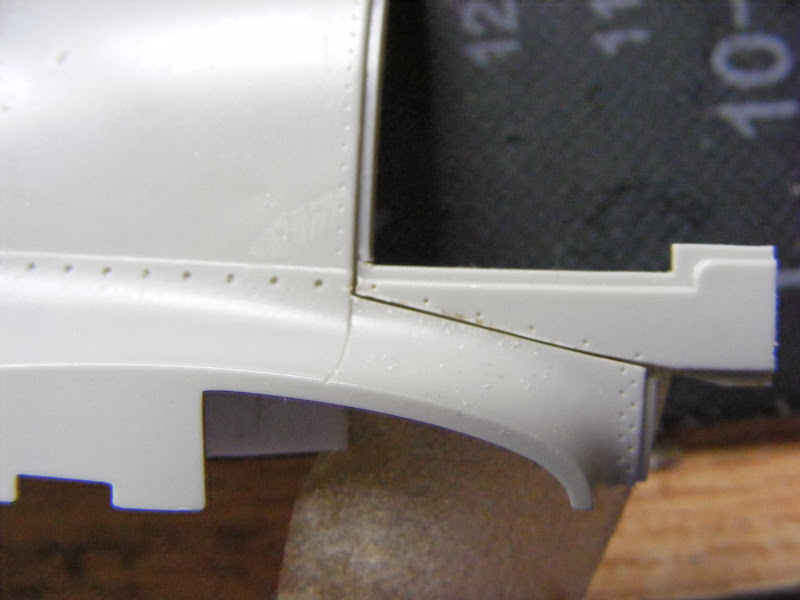 If you want to display the cowlings open you need to carefully cut this sort of triangular piece from the fuselage... ... and then glue it to the cowling so it looks like this: This applies to all Trumpeter Bf 109s from F to K in both 1:32nd and 1:24th scales. The model sounds satisfactory to me; I had some trouble with their ME 262 but overall was impressed. Florin, thanks for the info about the cowl. Any info about who the markings are for other than JG 53?